The antibody reacts specifically with human Substance P. No crossreactivity with related tachykinins (human Neurokinin A, Neurokinin B, and Kassinin). Synthetic peptide corresponding to Human Substance P aa 58-68. Guinea pig bone marrow. The antibody binds to the substantia gelatinosa. Our Abpromise guarantee covers the use of ab14184 in the following tested applications. 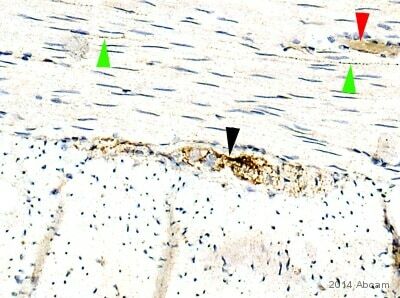 ab14184 staining Substance P in mouse spinal cord tissue sections by Immunohistochemistry (IHC-P - paraformaldehyde-fixed, paraffin-embedded sections). Tissue was fixed with formaldehyde and blocked with 1% BSA for 10 minutes at 21°C; antigen retrieval was by heat mediation in citric acid. Samples were incubated with primary antibody (1/500 in TBS/BSA/azide) for 2 hours at 21°C. A biotin-conjugated goat anti-mouse IgG polyclonal (1/200) was used as the secondary antibody. ICC/IF image of ab14184 stained PC12 cells. The cells were 100% methanol fixed (5 min) and then incubated in 1%BSA / 10% normal goat serum / 0.3M glycine in 0.1% PBS-Tween for 1h to permeabilise the cells and block non-specific protein-protein interactions. The cells were then incubated with the antibody (ab14184, 1ug/ml) overnight at +4°C. 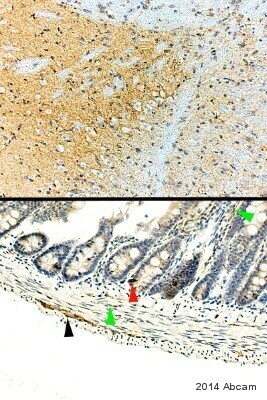 The secondary antibody (green)ÿwas Alexa Fluor© 488 goat anti-mouse IgG (H+L) used at a 1/1000 dilution for 1h. Alexa Fluor© 594 WGA was used to label plasma membranes (red) at a 1/200 dilution for 1h. DAPI was used to stain the cell nuclei (blue) at a concentration of 1.43uM. 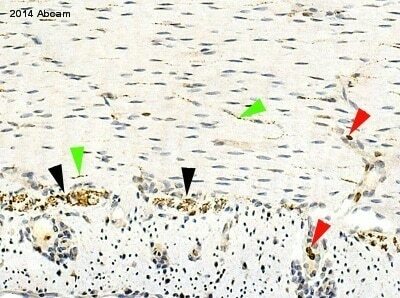 Immunohistochemistry (Formalin/PFA-fixed paraffin-embedded sections) - Anti-Substance P antibody [SP-DE4-21] (ab14184)Image courtesy of an anonymous Abreview. 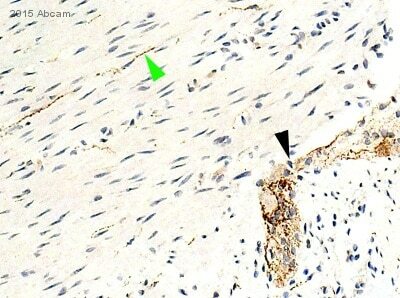 ab14184 staining Substance P in human pancreas tissue by Immunohistochemistry (Formalin/PFA-fixed paraffin-embedded sections). Tissue was fixed in formaldehyde and an enzymatic antigen retrieval step was performed. Samples were then incubated with ab14184 at a 1/100 dilution for 1 hour. The secondary used was an undiluted HRP conjugated goat anti-mouse polyclonal. Substance P staining at 1:1000 of the substancia gelatinosa (dorsal horn) of the guinea pig spinal cord using an HRP-conjugated secondary antibody and DAB. ab14184 detecting Substance P in Human Serum samples by sandwich ELISA. Samples were blocked with 1% BSA for 1 hour at 25°C and incubated with the primary antibody (1/400 in PBS) for 20 hours at 4°C. A biotinylated Rabbit anti-Substance P polyclonal (1/200) was used as the secondary antibody. Publishing research using ab14184? Please let us know so that we can cite the reference in this datasheet. 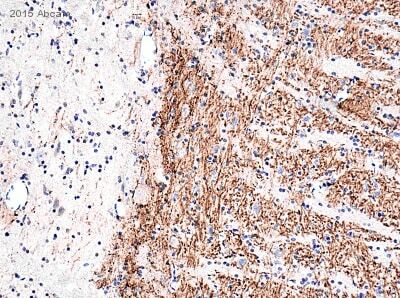 Product # ab14184 substance P antibody I am having a difficult time with this antibody for immunohistochemistry. Fix samples in 4% paraformaldehyde overnight. 1. Paraffin sections 2. Citrate unmasking PBS wash 3. Block 2-5% goat serum in PBS-1hr room temp 4. 1:1000-1:500 SubP antibody 4*C overnight PBS wash 5. 1:100 goat anti-mouse Alexa 488 or Texas red-2hr room temp PBS wash Nothing but background seen on rabbit sciatic nerve, rat tendon, testis, skin, heart, muscle and lung. All negative controls (no primary) tissues, especially rabbit nerve, have fluorescent areas within the tissues. 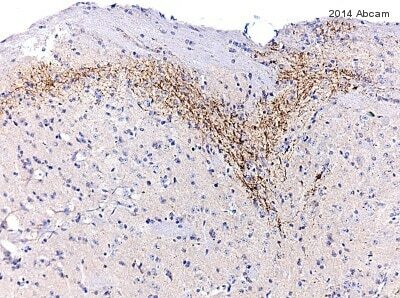 Have no indication that this antibody is working in any of my tissues.